Colourcraft Batik Fab Dyes	There are 9 products. 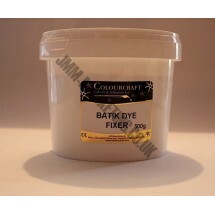 1 * Colourcraft Batik Dye Fixer 500g To be used in conjunction with Colourcraft Batik Dyes. Colourcraft Batik Fab Powder Dye 50g - Blue. A high quality concentrated cold dyeing system which can be cold fixed using Batik Dye fix below. Specially formulated for use on natural fibres for Batik work. They can also be used on paper. Colourcraft Batik Fab Powder Dye 50g - Brown. A high quality concentrated cold dyeing system which can be cold fixed using Batik Dye fix below. Specially formulated for use on natural fibres for Batik work. They can also be used on paper. Colourcraft Batik Fab Powder Dye 50g - Green. A high quality concentrated cold dyeing system which can be cold fixed using Batik Dye fix below. Specially formulated for use on natural fibres for Batik work. They can also be used on paper. Colourcraft Batik Fab Powder Dye 50g - Navy. A high quality concentrated cold dyeing system which can be cold fixed using Batik Dye fix below. Specially formulated for use on natural fibres for Batik work. They can also be used on paper. Colourcraft Batik Fab Powder Dye 50g - Orange. A high quality concentrated cold dyeing system which can be cold fixed using Batik Dye fix below. Specially formulated for use on natural fibres for Batik work. They can also be used on paper. Colourcraft Batik Fab Powder Dye 50g - Purple. A high quality concentrated cold dyeing system which can be cold fixed using Batik Dye fix below. Specially formulated for use on natural fibres for Batik work. They can also be used on paper. Colourcraft Batik Fab Powder Dye 50g - Red. A high quality concentrated cold dyeing system which can be cold fixed using Batik Dye fix below. Specially formulated for use on natural fibres for Batik work. They can also be used on paper. Colourcraft Batik Fab Powder Dye 50g - Yellow. A high quality concentrated cold dyeing system which can be cold fixed using Batik Dye fix below. Specially formulated for use on natural fibres for Batik work. They can also be used on paper.